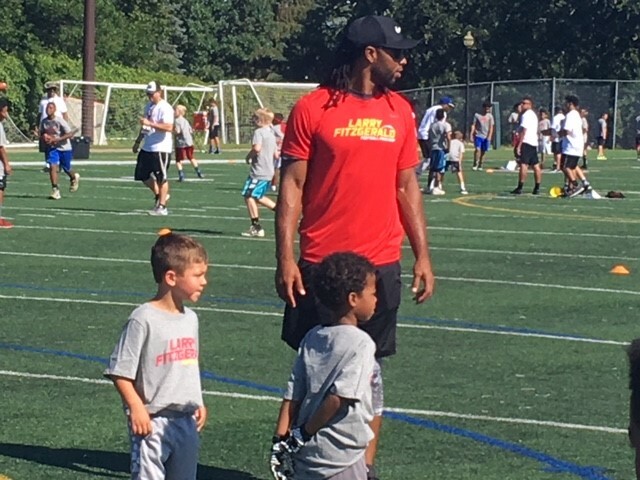 Vikings fans have been dreaming for years of Larry Fitzgerald Jr., who was a star at Holy Angels in Richfield, coming back to play for his hometown team. Larry Fitzgerald spent his formative years in the Twin Cities, with the coolest first job ever as a ball boy with the Vikings while shredding defenses as a wide receiver with Holy Angels. And he’s about to enter the 15th season of what almost certainly be a Hall of Fame career — all of it with the Cardinals. He was speaking to reporters at his annual football camp at Holy Angels, where reinforcing life lessons outweighed football lessons. Minnesotans probably just need to be content to admire Fitzgerald’s game from afar and his personality from up close. Fitzgerald, No. 3 on the NFL’s all-time receptions and receiving yards list, signed a one-year extension to stay with the Cardinals in 2018. He’ll turn 35 before the regular season starts, but with three consecutive 100-catch seasons on his ledger Fitzgerald doesn’t seem to be slowing down or going anywhere. He tried to recruit Kirk Cousins to Arizona in the offseason, but the QB wound up in Minnesota. He had nothing but good things to say about the Cardinals’ veteran consolation prize — former Vikings QB Sam Bradford — but wouldn’t there be a path by which Cousins could recruit him here next year for a Super Bowl push? What’s clear is the Vikings still hold a special place in his heart. Fitzgerald spoke of his “wonderful childhood” filled with local sports icons like Kirby Puckett, Kevin Garnett and countless Vikings. He lamented the fact that the Vikings are shifting training camp from Mankato to Eagan this year. And he showed that he still pays plenty of attention to the Vikings’ roster. Bradford could become the 15th different Cardinals quarterback to throw at least one regular-season touchdown pass to Fitzgerald. He might not be the last. Just don’t expect No. 16 to be a QB wearing purple, no matter how much mutual admiration exists. Vikings' linebacker question: Who will start with Kendricks and Barr? Will the Vikings defensive line reignite its pass rush?